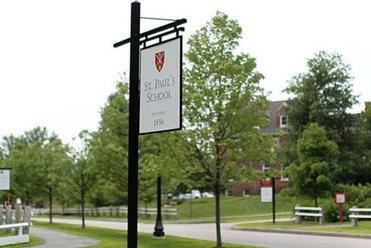 St. Paul&apos;s School is a private school in Concord, N.H.
St. Paul’s School has identified 15 additional victims in an ongoing investigation into sexual misconduct at the elite Concord, N.H., school, and five faculty members who are newly suspected of improper conduct, according to a report issued to the school community Wednesday. The report, the second in six months detailing misconduct at the school, lists allegations of what school officials termed “profoundly disturbing” sexual behavior at the school over a span of 53 years, from 1956 to 2009, according to the letter to the school community. The new report presents investigators’ findings relating to the alleged sexual misconduct of 16 former faculty members and staff. Of that number, five were reported for the first time, 11 were previously known to investigators. In May, a report found that 13 former faculty and staff members at St. Paul’s School engaged in sexual misconduct with students over four decades, and faulted school leaders for their handling of the abuse. The May report took a look at sexual misconduct allegations up to 1988. The criminal investigation at St. Paul’s School could force the institution to change its culture. Since that report, a team from Casner & Edwards law firm that included former Massachusetts attorney general Scott Harshbarger has interviewed 43 people, according to Hirschfeld and Cox’s letter to the St. Paul’s community. The 30-page report released Wednesday provides detailed accounts of the alleged abuse, and names seven former staff members “who engaged in sexual misconduct against one or more alumni/ae,” the report states. Four of the seven are deceased. Another student alleged that a St. Paul’s teacher and administrator, who died in 1993, pinned him to the floor during an assault in the teacher’s on-campus apartment in 1970. Another student alleged another longtime teacher, who left the school in 2009, sexually abused him during the early 1980s. In the letter, Hirschfeld and Cox reiterated their praise for the school’s commitment to supporting victims, enhancing the health and safety of the school through staff training, and maintaining a zero tolerance policy for adults who harm children. But news of the latest allegations drew a sharp response from observers who have watched the investigation unfold at one of the nation’s most prestigious private schools. “It was out of control, there were a large number of faculty members who were preying on kids,” he said. MacLeish said he expects more former St. Paul’s staff members to be accused of sexual misconduct. “This is by no means all of the people that were engaged in this conduct with children,” he said. In July, New Hampshire authorities announced they were launching a criminal investigation of the school following new reports of sexual misconduct. That probe is examining whether the school engaged in conduct that endangered the welfare of a child and whether the school violated a law that prohibits obstructing criminal investigations, according to New Hampshire authorities. Messages left with the New Hampshire attorney general’s office were not immediately returned Wednesday night. St. Paul’s is the latest prep school to investigate claims of misconduct following a 2016 Globe Spotlight story that reported on allegations of abuse by more than 200 victims at 67 private schools in New England. globe.com. Follow him on Twitter @Danny__McDonald.